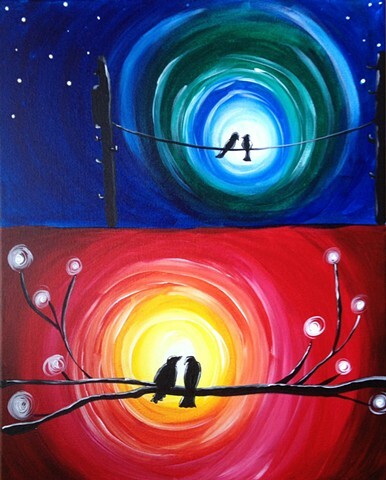 Shown here are 2 examples of how your guests will be instructed to create "Love Birds." During the Art Party your guests will have many different color options to chose from as well, creating a piece that is reminiscent of your special party but also personalized to them! Use this Paypal link to purchase single or multiple spots for your party. Each spot purchased is good for 1 guest at your party. Spots are $25 per person. A minimum of 5 spots must be purchased in the end to have your private art party. Contact me here at my webiste with any questions!